The procedure of ionometric titration has other characteristic features including s-shaped form of titration curves. At first, the procedure for ionometric titration takes more time than conventional titration. This is due to the dynamics of the electrode potential. Response time of electrodes in the neighborhood of the point of equivalence is much higher than outside of this neighborhood. If you do not wait for the stable value of potential, the error of analysis will be a great. The form of the titration curve is centrally symmetric, if compound with titrant has composition 1:1. This property is important, because most methods of analysis use such compounds. Titration curve is asymmetric for compounds of other stoichiometry. - for analysis in the presence of ions, which make it impossible to analysis by the method of calibration curve and the method of additives. An important step in the titration are mathematical methods for finding the point of equivalence. The most commonly used 2 ways for finding the point of equivalence. The first way is to find a center of symmetry of the titration curve, based on the fact that curve is centrally symmetric in the neighborhood of the equivalence point. Draw three straight line on the graph of titration. Two of them are parallel to each other and are tangential to some parts of the titration curve(see the red line in Fig. 2a). Than closer these direct will be located to the point of equivalence, so much the better. 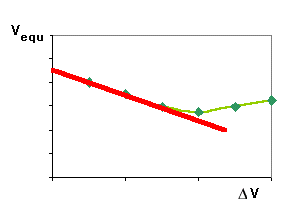 The third line approximates a points near the point of equivalence (see the green line). Middle segment AB is the point of equivalence. Some experimenters prefer to handle the titration curves as shown in Fig. 2b. If the titration curve is not perfectly symmetrical, then the results of such treatment is wrong, because finding value isn't center of symmetry. (Ei+1 - Ei)/(Vi+1 - Vi) where i - number of the point. The differential method allow to find the equivalence point asymmetric curves of titration. However, the differential method has its negative sides. At first, the calculations become more complicated. Secondly, it requires a more of number of experimental points in the neighborhood of the point of equivalence, that not always is good. Titration in the neighborhood of equivalence should be small portions of titrant, so as not to miss the maximum potential drop. This seems paradoxical, since a large number of experimental points should increase the accuracy of the analysis. In fact, there are no benefits as compared with the classical titration procedure! The best would be the method of calculation, which uses a mathematic model of titration curve. An example is the Gran's method. This method can not be recommended as a universal, since in some cases, the form of the titration curve can not be predicted. I can offer a new method of calculation, which reduces the importance of experimental points in the neighborhood of the equivalence point. Calculations are 2 stages. The first step is to compute several values of the equivalence point, using a simple procedures. The second step consists in extrapolating the obtained values for computing the true value of the point of equivalence. Calculating the value of each point of equivalence is similar to the procedure of differentiation. Necessary to calculate difference a potential (ΔE) between two points of titration curve, which are not necessarily adjacent. The volume of titrant between the two points must be constant (ΔV). The function ΔE = f (ΔV) has a maximum or minimum at the point of equivalence. You can get multiple values point of equivalence, changing the ΔV. Usage the linear extrapolation of these values allow to calculate the true value of the point of equivalence (see the red line in Fig. 4). The graph shows that for the extrapolation can be used not all points. The new method allows to evaluate the reliability of analysis. Measure of reliability is the constant slope of the line of extrapolation. 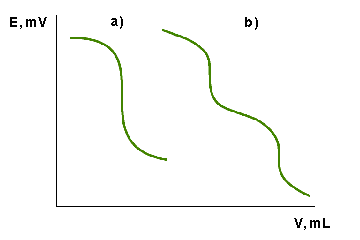 Slope of the line characterizes the asymmetry of the titration curve. Difference of the slope in each analysis is evidence of possible error. use of assessing the reliability of each analysis. not do calculations without a computer.